Remember Ikepod watches? Watches with a futuristic design that were out-of-the-ordinary. 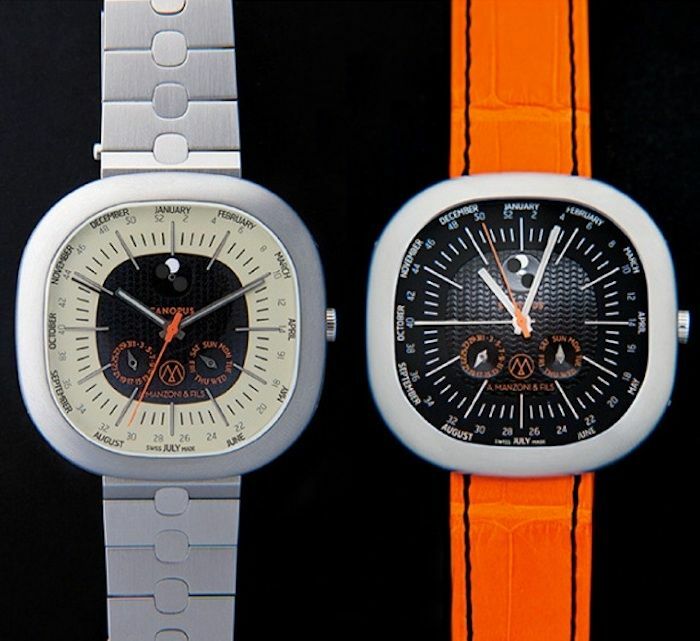 A number of their watches were designed by Marc Newson (who later also designed an Atmos clock for Jaeger-LeCoultre). 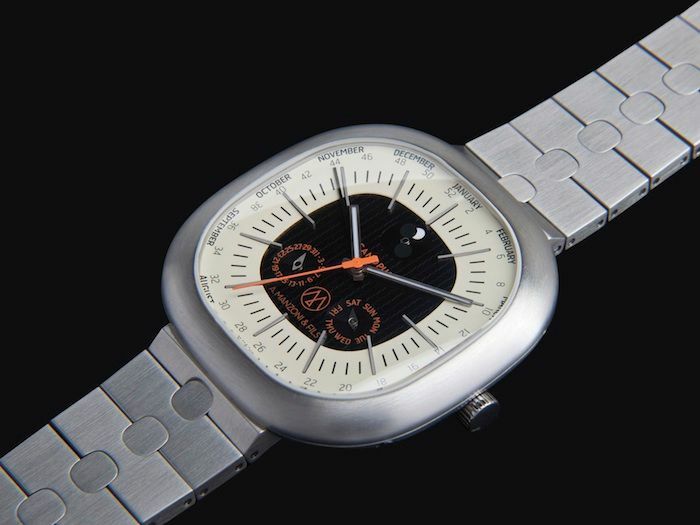 My favourite model was definitely the Ikepod Hemipode Cunningham Chronograph, but to this day.. I am not even sure if this company still exists. In any case, the original founder of that company was Oliver Ike. He started Ikepod in 1996 and quickly moved on to be a consultant to other watch brands. However, he found it challenging to work on other brand’s master pieces while he still had his own master piece in mind. Oliver Ike and Swiss watchmakers A.Manzoni & Fils decided to perform a re-launch of A. Manzoni & Fils. The most important ingredients had to be the art of Swiss watchmaking and contemporary design. Together with Finnish designer Ilkka Suppanen they came up with the Canopus Weekplanner watch. An interesting design with a mechanical complication that is able to indicate the week number, day of the week, month, date, moon phase and of course the time. The A. Manzoni & Fils Canopus Weekplanner has 4 correctors to set the day of the week, number of the week, the date and moon phase. These features have been embedded in an exclusive movement module developed by Dubois Depraz and has been attached to the base caliber by Soprod (caliber A10). The movement has a nice finish on the rotor which is called ‘Côte de Copacabana’. Very exotic. As Ilkka Suppanen explained, the design of the watch “the shape is not round, not square, but somewhere in between…”. As simple as it seems, the design of the Canopus Weekplanner is quite complex. The shape of this watch is based on a super ellipse, a symmetric curve discovered by a French mathematician (Lamé) in the 19th century. This design also resulted in a very complex shape for its sapphire crystal. 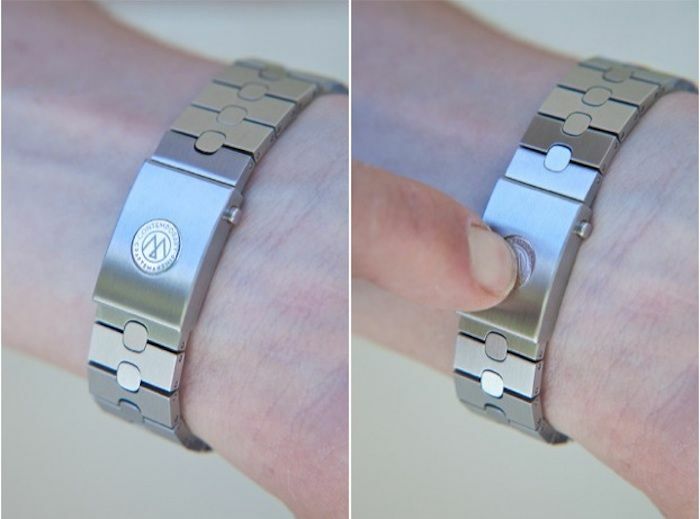 A very cool feature of the watch is the resizeable bracelet. We’ve seen the comfortable resizing system from brands like Rolex (Glidelock system), but what A.Manzoni & Fils did is probably even more comfortable. Resizing can be done on the wrist and very precise, while wearing the watch on your wrist. The Canopus Weekplanner comes in a hand made mahogany wooden box and with both a metal bracelet and a leather strap. The leather strap has been crafted by Camille Fournet. The dimensions of the watch are 44mm (diameter) x 10mm (height) and it is water resistant up to 10atm (100 meters). As already mentioned, the watch has this rapid bracelet change mechanism (which is patented) for easy and comfortable wear. Starting (or reviving) a new brand is very expensive. Oliver Ike decided to use the Kickstarter programme to get funding for his new watch brand. If you participate in this program – between now and October 27th – you can order your watch for 1/3rd of its retail price. Money will be invested in converting the prototype model intro a production watch, adapting the developed DD module movement to the Soprod A10 movement and placing a first minimum of orders with their suppliers for all other parts. A. Manzoni & Fils is very clear that this money will not go into expensive marketing activities like hiring brand ambassadors. Also, visit the official A.Manzoni & Fils website.